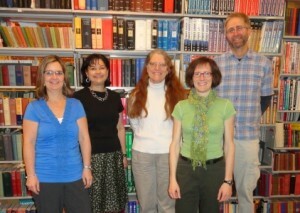 The APRL staff. From left to right: Krystal Harter, library assistant; Deb Placky, library assistant; Betsy Gamble, technical services coordinator; Tara Murray, director of information services/librarian; Scott Tiffney, reference assistant. This is the fifth in a series of daily posts about how the American Philatelic Research Library serves the philatelic community as we celebrate National Library Week. The APRL makes as much material as possible available online so researchers can identify and request research material any time. This includes our online catalog and article index, digital publications, the Philatelic Literature Review, subject guides and finding aids, and this blog. Our staff works hard behind the scenes to make all of this possible, but we are also available to assist you personally in finding the information you seek. We receive phone calls, emails, and letters daily from members looking for anything from a page in a catalog to a literature search. While we do not have the time to do extensive research for you, we are always happy to look something up in a book or journal, to help you search the catalog, to give advice on the best way to proceed, and to copy or scan indexes, tables of contents, and other references that may assist you in requesting material from the library. Whether you are just curious about something in your collection or embarking on a serious research project, we welcome the challenge of answering your questions. You can reach us at aprl@stamps.org, 814-933-3803 (select option 3 for the library), or APRL, 100 Match Factory Place, Bellefonte, PA 16823. This is the fourth in a series of daily posts about how the American Philatelic Research Library serves the philatelic community as we celebrate National Library Week. In Monday’s post, I talked about how the APRL facilitates cooperation among philatelic libraries. The APRL has also developed mutually beneficial relationships over the years with many specialty societies. These relationships often include an exchange with our journal, the Philatelic Literature Review, donations of publications, and sometimes even the donation of an entire library or society archives. These relationships helps us build our collection in specialized areas and promote specialty societies. When a collector begins to specialize and needs a more specific reference than the Scott Catalogue, they often turn to the APRL for specialized catalogs or articles from society journals. This may be their first introduction to a society. The societies that have donated their libraries, or portions thereof, to the APRL include: American Air Mail Society, American Helvetia Philatelic Society, American Revenue Association, British North America Philatelic Society, Columbia-Panama Philatelic Study Group, New York Estonian Philatelic Society, Polonus Philatelic Society (coming soon), Postal History Society, and War Cover Club. The APRL also houses the archives of a number of societies, including the American First Day Cover Society, Confederate Stamp Alliance, State Revenue Society, and U.S. Philatelic Classics Society. These donations come at a time when the society has determined it is no longer able or willing to maintain an independent library or archives. Depositing material at the APRL ensures long-term preservation of and access to the material. 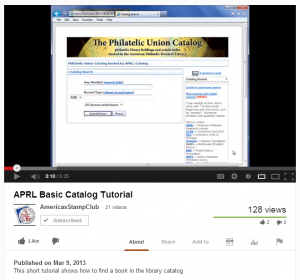 For societies wishing to continue to operate an independent library, joining the Philatelic Union Catalog can be a way to help more researchers discover their library. The Scandinavian Collectors Club library, housed at the Rocky Mountain Philatelic Library in Denver, has already begun contributing records to the union catalog, and we are working with other societies. This is the third in a series of daily posts about how the American Philatelic Research Library serves the philatelic community as we celebrate National Library Week. 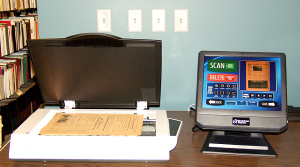 The book scanner used to scan articles, catalog pages, and book sections for library patrons. The APRL’s primary users are members of the American Philatelic Society, the majority of whom cannot easily travel to Bellefonte to use the library in person. How do we provide library services to people all over the world? By mail, fax, and email! Our services web page lists available options. Book borrowing by mail is available to APS and APRL members in the U.S. and Canada. Others can access our collections through interlibrary loan. We provide photocopies and scans of articles and book sections to anyone – APS and APRL members get a lower price. To learn more about our collections, search our online catalog, or read more about our collections on our website. This is the first in a series of daily posts about how the American Philatelic Research Library serves the philatelic community as we celebrate National Library Week. Most of the people who use the American Philatelic Research Library do so from a distance, and the primary access point is our online catalog. APRL holdings, including books, journals, auction catalogs for name sales, government documents, copies of exhibits, and more. To search these holdings, select APRL from the drop down box at the bottom of the search screen. What you won’t find in these records: individual journal articles, stamp show programs, price lists, and non-name sale auction catalogs (though we are starting to add records for each auction house with a summary of our holdings). You will find some records for archives and special collections, though these are not yet complete. 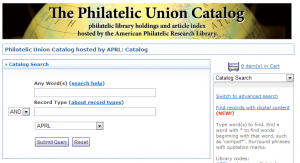 The Philatelic Union Catalog, including records from major philatelic libraries in North America, plus the holdings of the Royal Philatelic Society London’s library. The kinds of records included from each library and accessibility vary by collection. For more information, see the list of participating libraries. Though not all of these libraries lend material, many can help with locating difficult to find books and journals, and sometimes it is helpful just to know a book exists. To search the union catalog, select All libraries and indexes from the drop down box at the bottom of the search screen, or select the location code for an individual library. When searching the union catalog, take note of the location code in each record. If multiple libraries have a book, you will see a record for each library. Keep in mind that not all libraries have contributed records for journals, auction catalogs, and other “non-book” items in their collections. The philatelic article index includes thousands of records for articles in philatelic journals, magazines, newspapers, and even stamp show programs. The majority of these were contributed by Gene Fricks, and additional records have been added by the Postal History Foundation, APRL staff, and other volunteers. To search for articles, select All libraries and indexes from the drop down box at the bottom of the search screen and type article in the Record Type box. The article index does not include a location code. To find out if the APRL has the journal issue containing the article, search the catalog for the journal title and look at the detailed information in the full record display. Despite its size, this index is far from comprehensive. Many journals have their own indexes (either print or online) and the Royal Philatelic Society London’s catalog includes additional journal indexes. For more help on searching the catalog, check out our YouTube video. This is the first in a series – if you have questions about searching the catalog, let me know and they may be the topic for future videos! As always, if you don’t find what you are looking for, contact us at aprl@stamps.org or 814-933-3803. We can help you search, and tell you about materials not listed in the catalog. The American Philatelic Research Library joins libraries in schools, campuses, and communities nationwide in celebrating National Library Week April 14–20. This week is a time to highlight the value of libraries, librarians, and library workers. Libraries today are more than repositories for books and other resources. Though the people who use the APRL live all over the country and around the world, the APRL serves as a common place for stamp collectors, postal historians, and anyone researching stamps and the mail. Read the full press release on the APS website for more, and check back at this blog each day April 14-20 for a new post about how communities matter at the APRL!